While the bustle of Cebu City isn't for everyone, if you are willing to look beyond the noise and exhaust fumes there’s a rich historical centre to explore. Here you’ll find The Basilica del Santo Niño, the oldest church in the Philippines. Established in 1565 it’s been burnt down three times, with the current structure rebuilt in 1737. Also built in 1565 is Fort San Pedro, an attractive crumbling ruin away from the chaos of downtown Cebu. Having served as an army garrison, prison and city zoo, it’s now a peaceful walled garden, which is especially beautiful at sunset. There are also some nice little museums, including The Museo Sugbo, and no trip to Cebu City would be complete without taking the winding road up to the Tops lookout point, for unrivalled (unrivaled) romantic views. An island of contrasts, you couldn’t be blamed for shunning Cebu’s urban centre completely in favour of its scenic natural charms. While the closest beaches and dive spots to Cebu City are found on Mactan Island just to the southeast, it’s worth travelling further afield to experience the best of what Cebu has to offer. Those on the hunt for world-class diving should head north to the tiny idyllic island of Malapascua. As well as the chance to dive with thresher sharks, Malapascua’s stunning beaches and a great party-loving atmosphere make this one of Cebu’s most popular destinations. Despite recent growth it’s distance from the airport means it’s yet to be over-developed, allowing you to explore some of it’s highlights including the blindingly white Bounty Beach, on the island’s south coast, in relative peace. If your main priority is relaxing on a beach, Bantayan Island is the perfect destination. While you won’t find any diving here, there are plenty of lovely beaches, lively bars and tasty restaurants. Head to the relaxing town of Sante Fe on the islands southern coast for the best resorts and beaches. 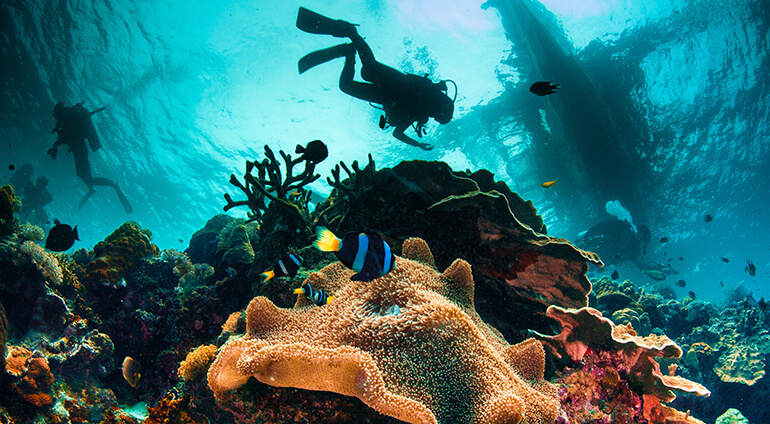 Less secluded, but still a popular haunt for divers is Moalboal, on the south-western flank of Cebu island. Rowdy Panagsama Beach is famous for the amazing sardine run that divers and snorkelers can experience just metres offshore, as well as its many bars and restaurants, while White Beach is a prettier stretch, popular with locals. Perfect for the adventurous traveller, Moalboal is also a great base to explore Cebu’s central mountains, with canyoning, hiking, kayaking, mountain biking and horse-riding all on offer nearby. It’s worth taking the trip 17km south of Moalboal to explore the Kawasaki Falls, a series of three waterfalls, the largest of which cascades 20m into a huge swimming hole. While the main pool has been a victim of its own success, a little spoilt by the crowds, there are secluded spots to be found near the more peaceful, smaller waterfalls. The Mainit Springs to the north of Moalboal are a much less touristy option and although they are less dramatic, here you’ll find a series of pretty 3-8m falls dropping into swimming holes, with the warm springs claiming to have healing properties. Nature-lovers may also enjoy the Olango Island Wildlife Sanctuary. An incredible 1030 hectares of sand flats and mangroves, this sanctuary supports 48 species migratory birds, the largest concentration in the Philippines.